GlycanAid® HA Advanced Formula revitalizes your dog’s painful joints bringing them back to health quickly and effectively, even if they have recently had major orthopedic surgery or are suffering from severe arthritis. TopDog’s No-Risk All-Results 100% Satisfaction Guarantee Policy. * We stand behind our products. Learn more about our 100% satisfaction guarantee. 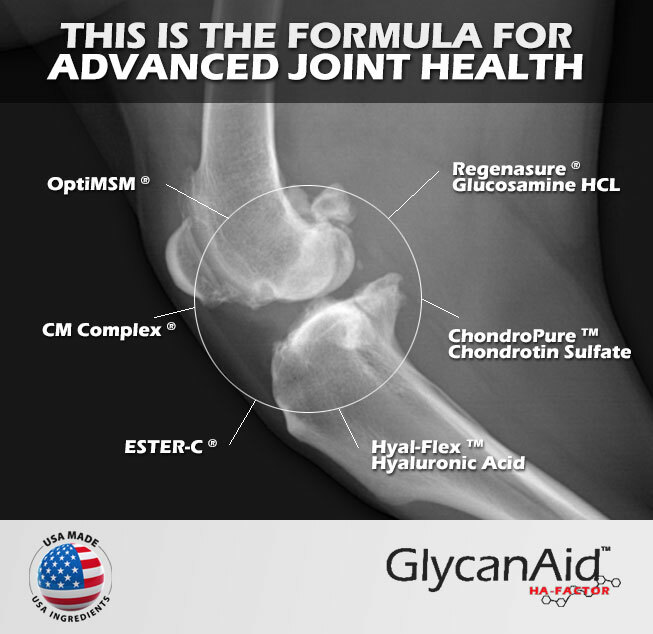 GlycanAid® HA Advanced Joint Health Formula is specifically designed for dogs requiring the maximum degree of support to maintain the structural integrity of their joints and connective tissues. 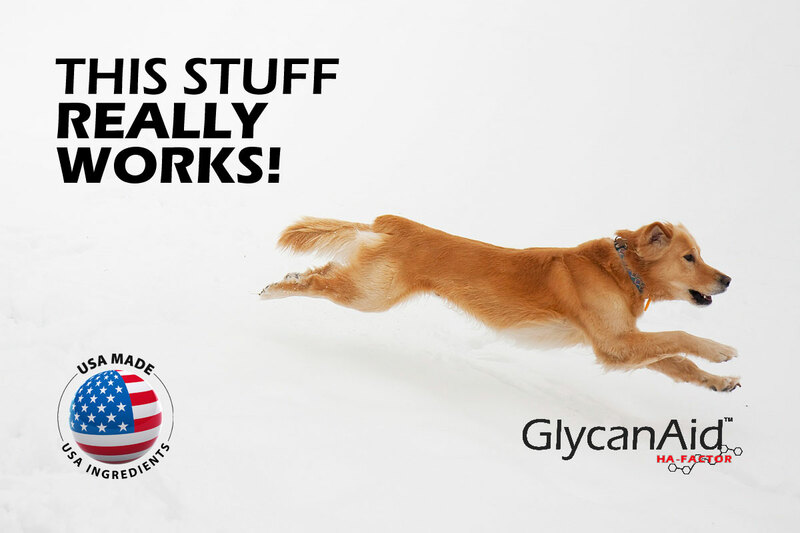 Whether your dog has recently undergone major orthopedic surgery or is in need of advanced joint support, GlycanAid® HA incorporates the proven ingredients for success. These tasty chewable tablets are recommended by veterinarians across the world. 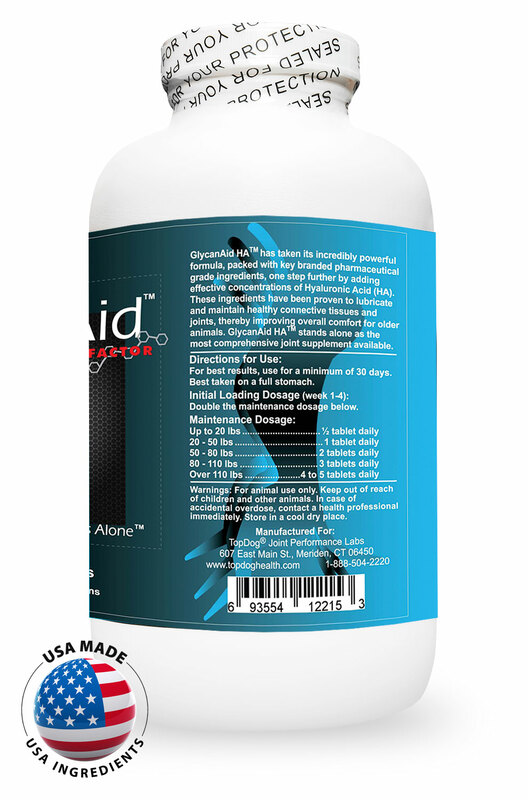 GlycanAid® HA Advanced Formula is unlike any other joint supplement on the market. The proof supporting why it works so good is based on a two part philosophy. First is the philosophy behind the formula. GlycanAid® HA Advanced Formula was designed to be the premiere natural joint health supplement by incorporating everything a dog needs for the maximum level of support, specifically during times of increased stress, such as after orthopedic surgery. 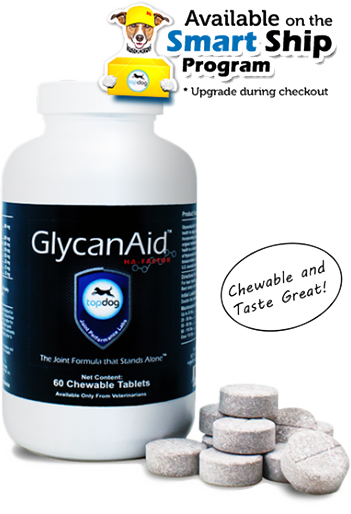 In addition to utilizing only the highest quality ingredients, Glycanaid® HA Advanced Joint Health is manufactured with integrity and scientific backing, so that you can be confident you are providing the best for your dog. Our most popular joint health supplement for dogs. This five-star rated joint supplement was created specifically for pet owners who want only the best for their dogs. Not only is it Made in the USA but it is only Made with the best USA ingredients. 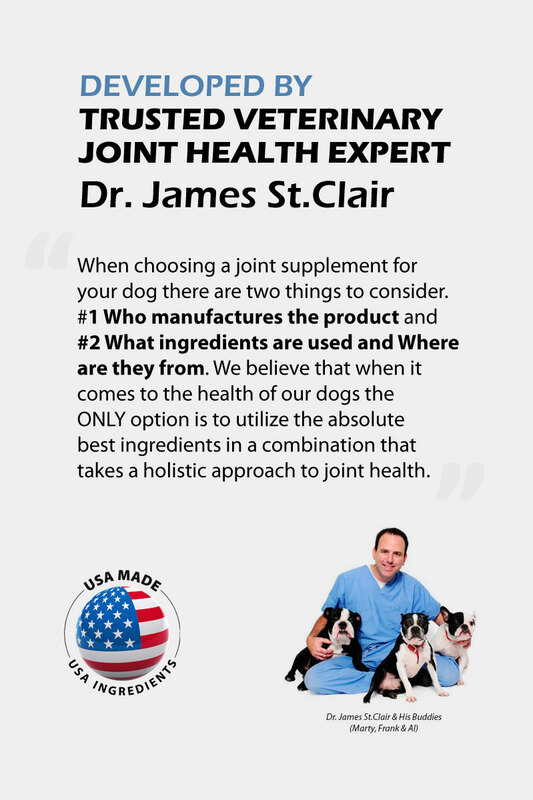 This carefully selected group of ingredients work synergistically to promote optimal joint health and therefore optimal comfort for your dog. 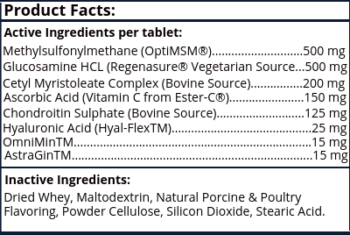 Best of all these treat-like tablets taste great and are back by TopDog’s 100% Satisfaction Guarantee; if at any point you don’t believe this is a absolute best joint health supplement for your dog simply return it for a full refund. Each chewable tablet contains Regenasure® Glucosamine HCL 500mg, OptiMSM® 500mg, Chondropure® Chondrotin Sulfate 125mg, Cetyl Myristoleate Complex 200mg, Ester-C® Vitamin C 150mg, Hyal-Flex™ Hyalruonic Acid 25mg, OmniMin™ Minerals 15mg and AstraGin® 15mg. 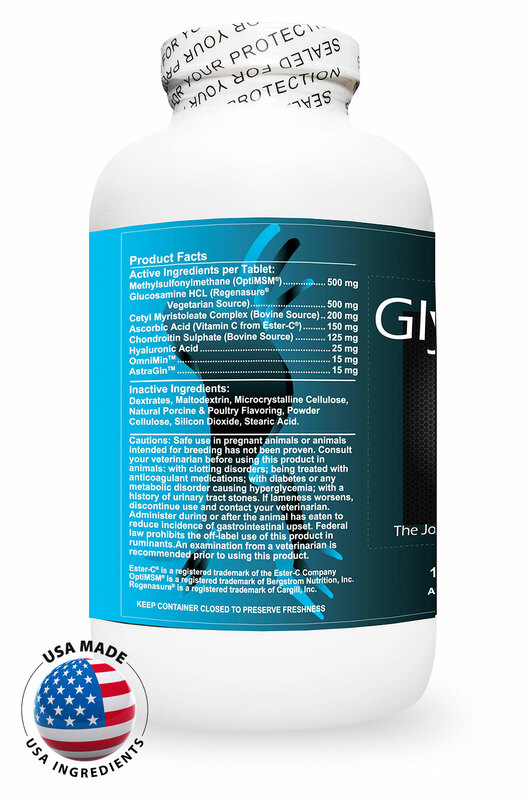 Glucosamine HCL (Regenasure®) : This 99% pure superior form of glucosamine stimulates chondrocytes to manufacture collagen and proteoglycans, which are essential for maintaining healthy cartilage and joint function. Glucosamine HCL has been known to normalize the synovial fluid which lubricates joints and also serves as a mild anti-inflammatory. Chondroitin Sulfate (Chondropure®) : Chondroitin is a cartilage component that promotes water retention and elasticity, and inhibits many of the degradative enzymes that bred down the cartilage matrix and synovial fluid. Chondropure® is a low molecular weight molecule (12,000 Daltons) for superior uptake. Methylsulfonymethane (OptiMSM®) : The only patented, 99.9% pure, premium distilled MSM on the market. This naturally occurring bioavailable sulfur is an essential building block for all cell membranes. It allows for more efficient uptake of nutrients and elimination of metabolic waste at the cellular level. It is also a proven potent natural anti-inflammatory. Cetyl Myristoleate Complex : This exclusive blend of pure cetyl myristoleate and other long chain esterfied fatty acids is a safe and proven natural anti-inflammatory which help to maintain joint mobility. Ascorbic Acid (Vitamin C from Ester-C®) : This patented, innovative form of vitamin C is four times stronger than ordinary vitamin C. In addition, this non-acidic form does not cause acidity problems normally associated with ascorbic acid and therefore does not upset the stomach. Great Salt Lake Salts (OmniMinC®) : This all-natural, low-sodium full-spectrum, ionic sea-mineral concentrate from Utah’s Great Salt Lake is important for the absorption of vitamins and nutrients. Hyaluronic Acid : This glycosaminoglycan functions as the backbone of proteoglycan aggregates and has been proven to serve as a lubricant and shock absorber in the synovial fluid. AstraGin® : is a 100% natural compound composed of highly purified saponins isolated from the Astragalus membranaceus and Panax notoginseng plant. It holds a US patent for “Method for enhancing nutrient absorption” as well as multiple international patents. In multiple pre-clinical studies, AstraGin® has demonstrated it may help support absorption of certain nutrients including amino acids, minerals, and vitamins. 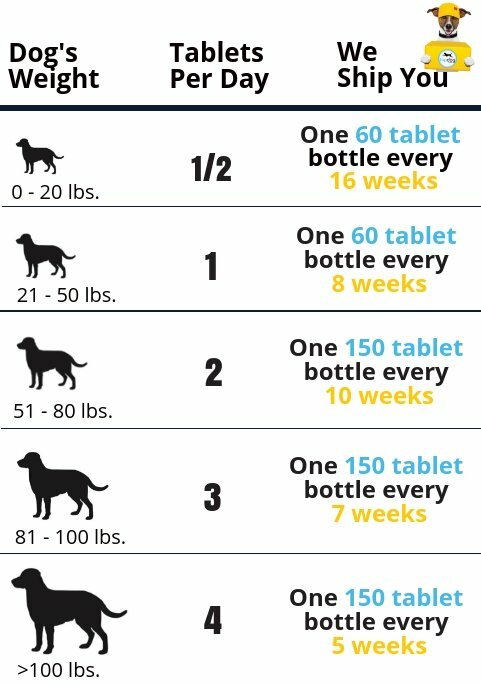 Whether you dog has or has not previously been on a joint supplement, TopDog recommends a proper loading dose phase for GlycanAid® HA. Therefore, in the first 4 weeks the maintenance dosage is doubled. Dr. J, I was a veterinary surgical tech for many years and I’m very knowledgable in animal health, large and small animals. I’m very, very skeptical with it comes to supplements claiming big improvements. Glycanaid? All I know to say is WOW, WOW, and WOW! My 14 year old rat terrier had been stiff in his front legs and his hind legs were starting to collapse when he’d stand up on them. I know all too well the side effects of Prednisone and I didn’t want him on it long term, and pain meds help, but they just mask. I truly wish I had taken before video of my boy. We just finished the 14 day loading dose and honestly I was not expecting any real results for 6+ weeks. We live in the country on a farm in a leash free world… I can’t keep up with him! He is standing strong on his hind legs for treats. He even brought the cows in at feeding time yesterday. He is attempting to jump up on the bed again and I believe he’s going to succeed soon! I wish all veterinarians would carry this product. I have also given my boy the Flexerna oil. The results are nothing short of phenomenal! No side effects either!! Thank you, thank you!! I know he’s in his golden years and we all wish they’d live longer, but now he can enjoy himself again…. and I have peace of mind knowing he is comfortable and NOT ON PREDNISONE!! Thank you again!!! 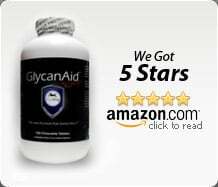 See all GlycanAid HA reviews and testimonials here.